A while ago I was having lunch with some fabulous solopreneurs and the topic of email came up. I surprised her by telling her I don’t keep my inbox at zero – at all. Looking at my main inbox right now I have nine read emails and five unread. In my other inbox folders (it’s Gmail so I make use of the inbox tabs) I have 42 read emails and 32 unread. Why don’t I do the “Inbox Zero” thing? I’ve tried doing the Inbox Zero thing in the past and all it did was result in me checking my email every 15-30 minutes to make sure I still had zero emails in my inbox. That makes it very difficult to get much else done effectively or quickly. And while keeping your inbox at zero all day isn’t actually the point of the Inbox Zero strategy, my brain seems to think it should be when I’ve tried it. If the goal is to process ALL email each time I go into my inbox, then all email get’s treated with the same level of urgency. Have an email from a client asking a question? Yes, reply fairly quickly. That makes sense. Have a newsletter from someone you can’t immediately place? Read it NOW and make that inbox be zero! Well, that doesn’t seem like it’s the best use of your time. What does make sense is to answer the urgent or important emails quickly now and come back to process/delete/read the other emails when you have time. I don’t always have time to clear out my email every day. Some days other things are more important than a newsletter in my inbox, even if it’s one that I LOVE to read. AND I still want/need to respond to emails from clients, potential clients, and friends. 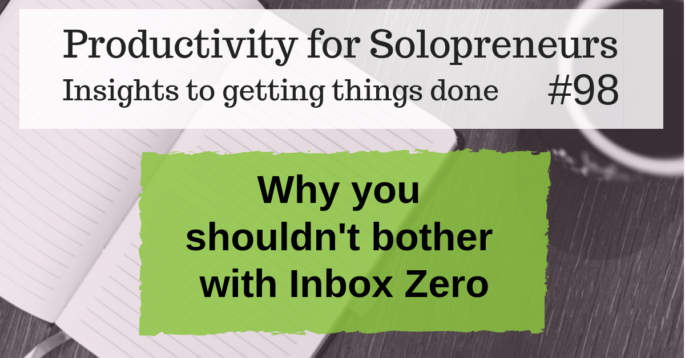 Don’t strive for an inbox of zero. It’s just not the best way to use your time. Instead, find or create an inbox system that works for you and keeps your email at a manageable level where the important emails are responded to and the unimportant are quickly dealt with when appropriate. Do you have any questions about managing your inbox that you’d like answered? Comment below and let me know. A friend sent me an article last week that talked about why he (the author, not the friend) didn’t use a to-do list anymore. I’d seen the article before and others like it. It’s actually less about not using to-do lists and more about why the way he was using a to-do list wasn’t working for him. But more importantly, it reminded me that when I talk about to-do lists I might be thinking of something different than you are. The list of things you plan to get done if today is the perfect day with no interruptions or unexpected side tracks AND if you can get 12 hours of work done in 7 or less! Well then, of course, to-do lists are the spawn of Satan! Go ahead and stop using that to-do list. Seriously. It’s not helping you. When I talk about my to-do list it’s the things I’ve decided I’m going to do today. It’s based off my weekly to-do list which comes from my goals and intentions for the month and the things that I do on a regular basis to make my business and day run. A book I recently read referred to this as a “will-do list”. It’s the list of thing you will do today. Decide 2-3 things (not projects) that you’ll complete tomorrow and write them down. Look at how much time you have to work tomorrow and divide it by 2. Write down the tasks that you know you can complete in that amount of time. Example: Let’s say you have from 9-3 with an hour for lunch to work. That’s 2.5 hours worth of tasks (9-3 is 6 hours. 6 hours minus 1 hour for lunch is 5. And 5 divided by 2 is 2.5). Try it for a week and see what happens. I talk about this topic in the video below. When is it time to unsubscribe? The places I find myself wasting time sometimes surprise me. I LOVE listening to podcasts and last month when I slowed down quite a bit (you can read more about it here) I found myself realizing I had quite a backlog of podcast episodes to listen to. I didn’t consider it wasting time though. After all, listening to podcasts is something I do in my spare time. Hmmm, maybe there’s some information hidden in that thought that I should pay attention to. But they were business/entrepreneur type podcasts that I felt I should be listening to. Well, isn’t that a silly reason to keep listening to a podcast I regularly wish would be over. This lead to some other small, but impactful changes in both my podcast listening habits and email. 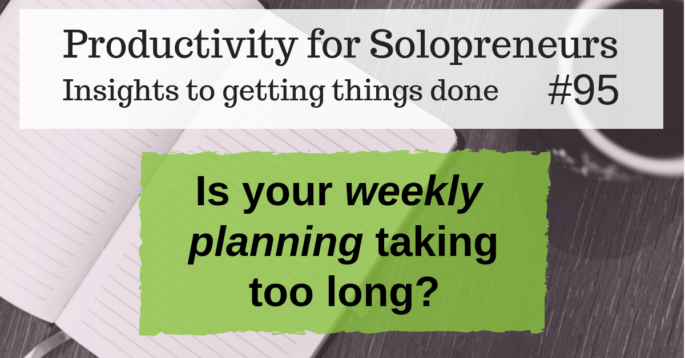 If your weekly planning is regularly taking more than 20 minutes then something needs to change! Last week I came across someone sharing about how to plan your week. I LOVE hearing how other people do things and I had some time, so I started watching. This person shared that she sets aside about 2 hours on Sunday to do her weekly planning. We’re going to talk about that this week on Productivity for Solopreneurs: Insights to getting things done. You can watch it (or the recording) below on Wednesday at 1pm. Schedule a session with me by clicking here. You’ll leave knowing exactly what to do to make planning your week (and to-do list) easier. Despite taking a break from Wednesday LIVE with Evie last month and my general slow down (read about it here, here, and here), I was working on some things behind the scenes. If you’re in my Facebook group, Productivity for Women Entrepreneurs, you might already know what that is. 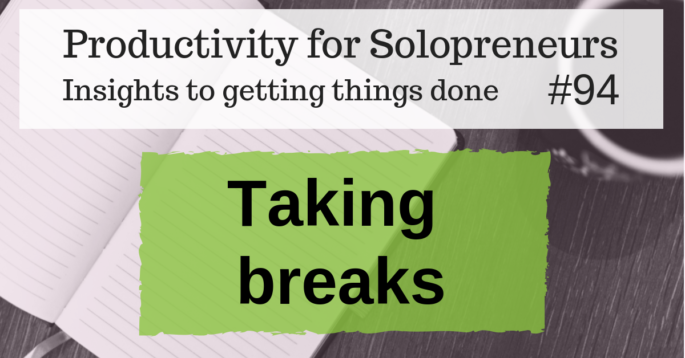 I decided to rename my weekly Facebook live from Wednesday LIVE with Evie to Productivity for Solopreneurs: Insights to getting things done. This week’s topic is about taking breaks. And not the breaks in your workday where you get up and away from your desk for a bit. But the breaks that give you the space you need for what’s coming. And I’ll talk about my January break.